Browse: Home » Features » Snake… You Stink! “Realistic” may well be one of the most flexible words in video game discourse, right up there with “microtransaction” and “action-adventure.” The beauty of “realistic” is that it can be used to signify practically anything, from day-night cycles, to hunger mechanics, to a game where you have to make sure your character remembers to blink. Whether the word sends shivers down your spine or thrills you to the core depends almost entirely on what you look for in a game. While anything can be described as “realistic,” the sticking point is that of mechanical realism, game mechanics that engage the player in ways that emulate real life experiences. It’s a boon for the survival enthusiasts and a curse to the mascot platformers, but in truth the quality of any “realistic” mechanic comes down to how the developers answer one question, whether it be eating, sleeping, or breathing: how does one recreate the routine chores of daily life and make them engaging? Enter Metal Gear Solid (MGS), a series that has toyed with the idea of “realistic” elements ever since MGS1, when it asked the player to run around Shadow Moses in order to expose a key card to various temperatures. Pretty much every mainline MGS title incorporates some unusual application of realism, be it MGS4’s psyche bar that indicates Snake’s real-time emotional state, or MGS2’s real-time melting ice that has no explicit purpose. But the first game in the series to embrace realism as part of a fully immersive sandbox world is Metal Gear Solid V: The Phantom Pain, which puts players into the boots of the legendary Big Boss (aka Venom Snake) as he rebuilds “Mother Base;” his dream of a private army beholden to no country. As Big Boss, the player, in addition to their exciting stealth-action adventure, is encouraged to take on all the responsibilities of a renowned leader of a paramilitary outfit; building and maintaining state of the art facilities, recruiting and training fierce squads of private soldiers, managing large quantities of valuable resources, researching dangerous new weapons, leading the charge towards worldwide denuclearization, and the most important task of all: showering regularly. It sounds like a joke at first; encouraging the player to pause their fun action/base building game to pop in for a quick shower, but there it is, a small portable shower on each of your base’s platforms, easily accessible with the press of a button. As the player takes on missions running around combat zones, crawling through dirt, and neutralizing enemies, Big Boss begins to accumulate dust, dirt, and blood on his combat gear. In extreme cases he may even begin to alert enemies with his stench. Hopping into any one of the game’s shower kiosks will solve this issue in a few quick seconds, and push out a squeaky clean Big Boss, fresh and ready for his next roll in the dirt. In time, taking a quick shower break every time you end up back on base becomes as routine as spotting your targets or checking the menu for upgrades, and the mere act of cleaning up for the next mission can become as cathartic and strategic as any enemy takedown or choice of loadout. With clever implementation and careful design, Metal Gear Solid V’s showering mechanic nails the balance between realism and abstraction and manages to make the mundane engaging. So how exactly does a game designer make a player say “I want to have my character shower real quick?” It starts, as any good mechanic does, by creating incentive. 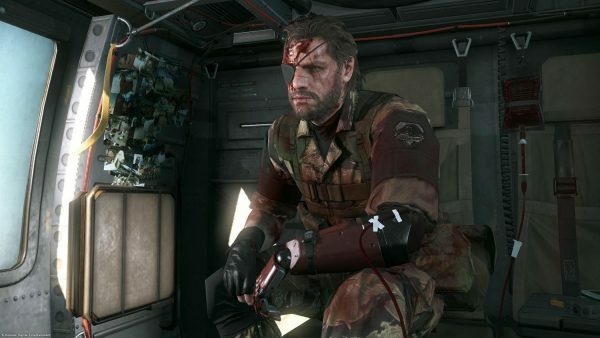 The player has good reason to shower: it rids them of a status effect that might impair their ability to sneak around, cleans up their outfit so Big Boss isn’t covered in dirt and grime while you stare at him during extractions, and provides a few small benefits to health regeneration, reflex mode, and fulton extraction. The benefits are minor, but so is the investment; showering takes only a few seconds at most, and there’s almost always a convenient location to take one on Mother Base. The player can take a handful of seconds out from their between-mission checklist to hop into a shower and it will provide them with the satisfaction of having optimized their stats slightly, giving them a blank slate for their next rendezvous. The other main component of any mechanic, and arguably the more important one, is that the penalty for not engaging with the mechanic is noticeable, but not overbearing or disproportionate. Any mechanic with a punishment disproportionate to its incentive is likely to frustrate or confuse the player. For example, We Happy Few features a system in which a player’s abilities are improved if they remain fed and hydrated, but impaired if they do not. Unfortunately, in early builds of the game, keeping up with the hunger and thirst meters was incredibly difficult for many players. As a result, engaging with the eating and drinking mechanics feels forced, and distracted from the game’s more interesting elements, thus leading to resentment of said mechanics and many high profile complaints. MGSV, on the other hand, makes the penalties for not showering obvious and noticeable in the form of dirt, blood, and flies buzzing around Big Boss, without making them overbearing or insurmountable. This, in turn, makes showering feel less like an obligation that must be attended to in order to continue playing, and more like a small detour that enhances the overall experience. It’s not uncommon in online games discussion to come across a philosophy that suggests if a mechanic emulates an activity as it would occur in reality, then that mechanic is justified in the name of realism. In truth however, realism is sacrificed so often and obviously in video games that even listing out more than a few examples seems a bit condescending. Of course guns don’t shoot in perfect straight lines, of course wounds aren’t instantly healed by medkits, of course adventuring through fantasy worlds is an ultimately unrealistic career path; but we accept these leaps in logic because they provide the feeling of being true, without bogging things down with reality. What really matters are the broad strokes: if you shoot your guns you will hit the enemy, if you pick up medical supplies you will be healed, if you adventure long enough you will attain money and fulfillment regardless of how many times your cousin suggests accounting as a fallback plan. It’s in this way that the showering mechanic in MGSV truly shines, with the key word being ‘verisimilitude.’ The core of why showering works so well in a game about mercenary stealth clones is because the game indicates both why showering would make sense (combat zones are dirty and make you smell) and the benefits of doing so (showering refreshes you and you won’t smell). It works as part of an immersive experience not just because the game provides some minor tangible benefits, but also because it makes sense on an instinctual level; the player sees they are dirty, and so realize they should take a moment to shower. The idea of presenting routine chores as part of a bombastic action game may seem silly at first, but there is a great deal to be gained from contrasting the extraordinary with the ordinary. Most entertainment sets out to create highs and lows, because without the lows, one cannot truly appreciate the highs. MGSV’s weapon upgrading, base building, and indeed, showering, might individually be seen as tedious, or even busywork. However, when taken as a whole, they work to create downtime between bouts of action that fits naturally into the world and story, while allowing the player to consider past events and plan their future goals. Without them, the game would consist solely of being dropped into different enemy outposts, and clearing them out one by one, until you get to the next cutscene. This might appeal to some, but will almost certainly grow exhausting for the average player. 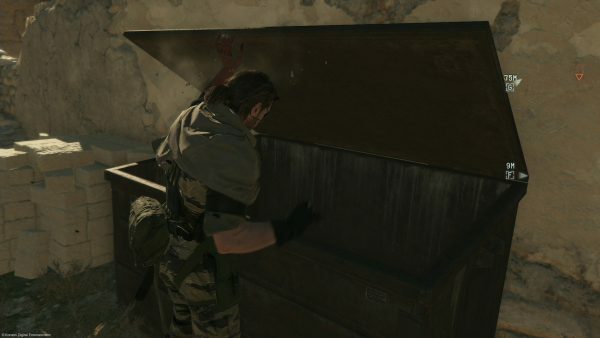 By implementing low intensity, typically mundane mechanics like the shower system, MGSV retains tighter control over its own pacing by encouraging the player to slow down and reflect on the connections between their decisions and the in-game consequences, even in small ways. It’s rare for something as simple as a game’s shower mechanic to be considered noteworthy, but even the smallest details can be significant when approached with thoughtful intent. 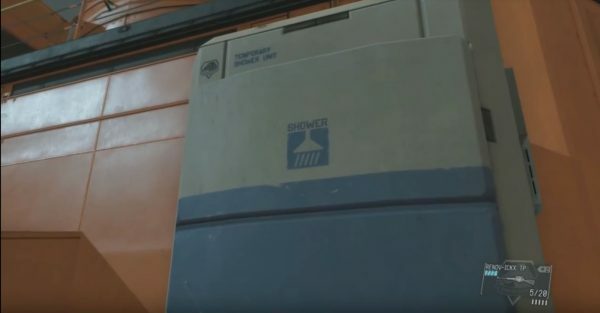 The developers’ ability to create a showering system with an actual incentive behind it is yet another sign of the care and attention that MGSV, and the series as a whole, is famous for. It demonstrates how a clever game designer can transform a routine chore into a natural and enjoyable part of a larger experience: one that complements the game rather than simply existing adjacent to it. It’s one of those little touches that pushes the boundaries of game design in unexpected and underappreciated ways, setting an example for game designers of all skill levels – not just the ones who want you to stay clean. Jared Bruett is a Creative Writer and Game Design pupil currently studying at Miami University (the one in Ohio). He spends his days thinking of cool projects he could be working on instead of the things he’s supposed to be doing. He dreams of one day working as a narrative designer in the games industry.